Harambee Stars secured a spot in Sunday’s Heroes Intercontinental Cup final against hosts India after a 4-0 win over Chinese Taipei in their last round robin match in Mumbai on Friday. Two goals from Jockins Atudo and one a-piece from Timothy Otieno and Dennis Odhiambo hitting a goal a piece. Following the result, Kenya, India and New Zealand all finished on six points but the home side topped with a better goal difference of +7 while Kenya finished second with a +2 goal difference. New Zealand was third with a +1 goal difference. Stars entered into the match knowing not more than a three-goal cushion in the match would mean their appearance in the final was never going to happen. The first half didn’t show of a side hungry to win. 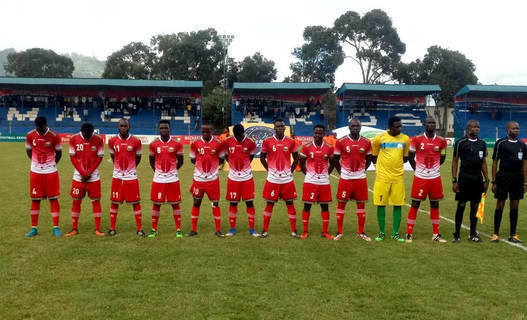 Kenya had two chances, one falling on Duncan Otieno who did well to go round the keeper but his eventual shot came off the side netting while later, Clifton Miheso’s attempt with his left foot went wide. In the second half Kenya survived a scare when Patrick Matasi made an important block to deny Ting-Yang Cheng who had shot at goal from a Cheng-Ming Wang’s cross. The striker followed up the rebound but could only hit it high into the stands. Having survived the scare, Kenya made an immediate response, Odhiambo breaking the deadlock. The Thika United skipper tapped the ball home from close range off an Ovella Ochieng cross. Eric Ouma’s right foot curl forced the keeper to turn the ball behind resulting in the corner. Kenya were 2-0 up two minutes later from the spot when Atudo converted low into the far right after the keeper had brought down Piston Mutamba inside the box. Atudo put the icing on the cake in the 89th minute when he pounced on another goalkeeping error to tap home at close range after the keeper spilled Mike Kibwage’s connection from a Makwatta freekick. Unused Substitutes : Timothy Odhiambo (GK), Bernard Ochieng, Johnstone Omurwa,Kenneth Muguna.